Phyllanthus amarus is a medicinal herb used in traditional Indian medicine for liver disorders. Several researches also show that it acts primarily in the liver, but the molecules were unidentified for liver protective activity. This study was to determine whether the lignans isolated from P. amarus attenuates the D-galactosamine (GalN) / Lipopolysaccharide (LPS)- induced acute hepatitis in mice. Standardize mixture of lignans (slPA) isolated from leaves of P. amarus using automated chromatographic technique was used for experiments. Experimental mice were orally pre-treated with slPA (10, 30 and100mg/kg) for 7 days before intra-peritoneal injection of GalN/LPS. Acute hepatitis in mice was confirmed by significant increase of pro-inflammatory cytokines, and hepatotoxic markers. Pre-treatment of slPA exhibit significant liver protection in dose dependant mannaer. In-silico molecular docking studies also suggests that lignans are preferentially more active due to strong binding affinity against pro-inflammatory cytokines; IL-1β, IL-6, and TNF-α. The electronic parameters of lignans for bioavailability, drug likeness and toxicity were within the acceptable limit. 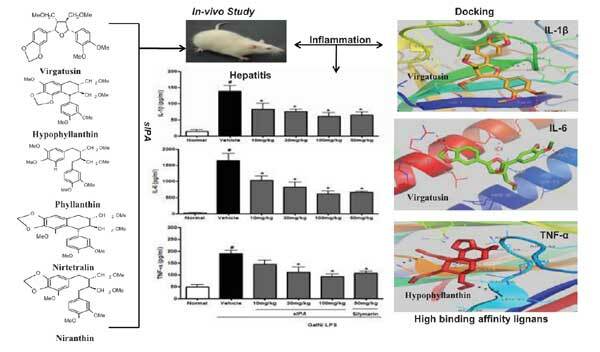 In-vivo and in-silico results suggest that pretreatment of slPA exhibit potent hepatoprotection against GalN/LPS-induced hepatitis in mice and the liver protective effects may be due to the inhibition of inflammatory mediators. Hepatoprotective, inflammation, lignans, mice, molecular docking, Phyllanthus amarus. In-Vivo Testing Laboratory, Molecular Bioprospection Department, CSIR–Central Institute of Medicinal and Aromatic Plants (CSIR–CIMAP), Lucknow 226 015, India.